Siteline invests wisely in the industry’s latest survey technologies and training to ensure we’re continually offering the widest, most effective spectrum of survey solutions possible. We pride ourselves on a collaborative approach that takes time to understand our clients’ requirements and gives advice on the most appropriate methods and delivers the right solution for everyone. The right solution won’t necessarily involve the latest technologies or the most expensive equipment; if it’s not necessary for your project, we won’t suggest it. GPS technology has been used extensively in surveying for many years and continues to develop, providing even more flexibility and functionality. By continuing to invest in the latest equipment and real time correction services Siteline remains highly qualified to conduct the most complex GPS surveys, quickly and efficiently to produce the most accurate results available. Our GPS services are used on virtually every land and topographical survey we undertake, regularly linking with real time coordinates from the Ordnance Survey Active GPS Network. Laser scanning is a new technology that’s increasingly replacing classical measurement methods and is used for the quick and complete measurement of complex geometries. 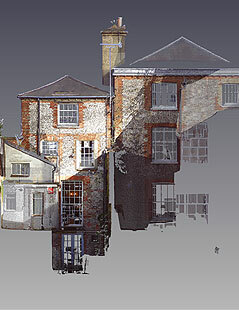 Using our state-of-the-art laser scanning equipment, Siteline produces highly detailed three-dimensional ‘point clouds’ of precise survey information. By capturing vast amounts of intricate data in a very short time, we can dramatically reduce our on site presence since decisions concerning the presentation of the data can be made during the office-based processing procedure. 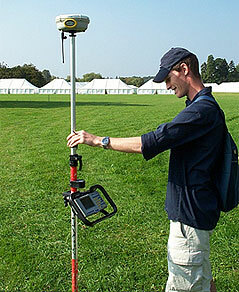 Additional data can also be extracted from the point cloud without the need for costly return visits to site. Laser scanning technology affords innovative methods of analysing and presenting the survey results, offering new deliverables for clients, such as animated fly-throughs and rendered models. 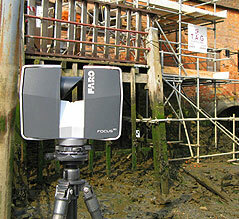 Our laser scanner is deployed across the full spectrum of survey styles; where access is restricted such as a confined space, working at height or highway condition survey; where intricate detail is required for a measured building survey of an historic property; for precision monitoring of a building façade, or for obtaining inaccessible data on neighbouring buildings for rights of light assessment.